It’s amazing how important culture fit is when hiring talent, even for software engineers. Most of the time, you are not only looking for someone who can solve problems, but also someone whose values, beliefs, and characteristics are a natural fit in your organization. Because culture fit varies greatly between organizations (and people), it can not be objectively assessed by tests or scores without bias. Regardless, video interviews provide a reasonable method for reviewers to understand the language level, behavior, and values of their candidates. The candidates record themselves on video answering specific questions, which a reviewer can watch at anytime. 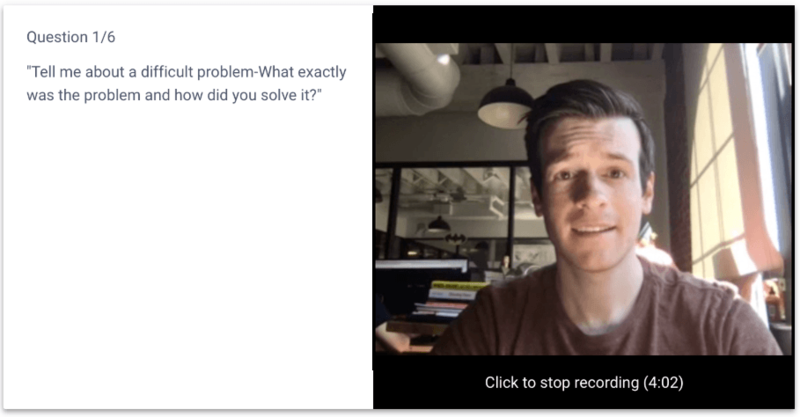 What type of video questions are most effective? Open ended question are the most effective. Question such as, “Tell me about a difficult problem. What exactly was the problem and how did you solve it?” can indicate a candidate’s problem-solving mindset and reveal whether they perform better under tight guidelines or prefer being autonomous. Others such as, “What do you like about X and what would you change about it?” are really good at exposing candidates who are exaggerating or faking their experience. Experienced engineers are more likely to talk about how the technology relates to other similar technologies in terms of implementation or performance. They may also talk about nitpicks or nuances based on the experiences that they have had. Less experienced candidates (or those with no experience) lean heavily on the surface-level details like syntax or popular libraries without any personal stories to back them up. Language and communication skill are easy to evaluate through listening to the candidates talk. Human beings can pick most things up in a matter of seconds. Depending on the question, you can also understand a bit about the candidates’ characteristics, working habits, mindset, and problem solving methodology, as well as why they want to work for your organization. Based on these factors, you can decide whether a candidate fits, eventually shaping a culture that helps your company thrive.